If you run into trouble, and things seem a bit "off," one common fix is to perform a "cold start." A cold start forces certain settings within the app to reset, potentially helping to alleviate the problem. This should not be necessary under normal circumstances, but if you contact support about your issue, they may advise you to do this. It's very simple, takes just a few moments, and can be useful when dealing with other misbehaving iOS apps, too. Instructions are slightly different between iOS 7 & 8 and iOS 5 & 6. 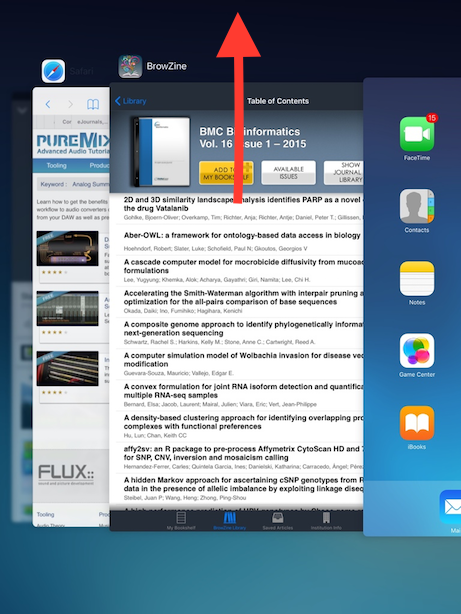 Quit BrowZine by tapping on the home button (the physical button underneath the screen). Double tap this button to see recently used apps in this "quick start" menu. There are settings that are saved with these apps allowing them to load quickly the next time and thus this should show a variety of recently run apps. Scroll so that BrowZine is in the middle as shown below if it is not already there. As indicated the by the arrow drawn over this image, simply grab the screen image of BrowZine and drag it up and you will see it disappear. Find BrowZine again on your iPad and tap to launch it again. This will now be a "cold start" of the app. If your issue continues to persist, please contact support further guidance. Tap the small red delete badge and BrowZine will go away. This does NOT delete the app from your iPad, but only removes it from the "quick start" menu forcing a "Cold Start" the next time you launch BrowZine. Tap the home button again to remove the Quick Start menu from sight. You can now find BrowZine and launch as normal. If your issue continues to persist, please respond to the ticket for further guidance.